The recent internecine killings, which claimed about 90 lives in Karbi Anglong district of Assam, have led to the displacement of over 44,000 tribal Karbis and Dimasas. Away from the attention of the national media, the displaced Karbis and Dimasas have been living in deplorable conditions. Janata Dal (United) leader Sharad Yadav’s maiden election to the Fifth Lok Sabha in 1974 at the age of 25 coincided with the present Speaker Somnath Chatterjee also entering the portals of Parliament. It was none other than Socialist leader Jaya Prakash Narain who persuaded him to file his nomination for a byelection in Jabalpur. Mention the word “Europe” these days and most people’s minds speedily couple it with such words as “row” or “rivalry”. All the more welcome, therefore, that in defiance of those stereotypical images of disharmony, the Europeans — and yes, that does mean us — launched our first test satellite of the Galileo navigation system. I was invited this week by a Students Union of a university from the (so-called) ‘cow belt’. It was a very different invite from earlier ones I had received from academic institutions. Reason being, the subject of talk: ‘Criminalisation of Student Politics’. Normally, students’ unions do not pick up a thorny subject that too in a university and a state which is known for criminalisation of (student?) politics. Therefore, it was a pleasant surprise and merited due respect. So the year ends and another one begins. Here, besides the so-called big bandobasts at hotels and motels, there would be what can be termed a cultural start to the year. Right from January 1, 1989, when writer-activist Safdar Hashmi was fatally attacked by political goons on the very outskirts of New Delhi. This day stands as the take-off day. This article seeks to examine why the Government of India needs to adopt a policy to provide humanitarian assistance to the conflict induced internally displaced persons. In fact, this is one of the main recommendations of our report, Lessons Not Learnt by Assam: Ethnic Cleansing and Internal Displacement in Karbi Anglong and North Cachar Hills (November 7, 2005) prepared by this writer on behalf of the Asian Centre for Human Rights. When this writer visited the affected areas last month, the Assam government had no plans but somehow disperse the inmates as soon as possible. The Oxford English School at Manja, Diphu, district headquarters of Karbi Anglong, housed over 2,000 displaced persons. There is not adequate space to even stand up, if it rains. The majority of the people were sleeping in the open. There is rice and dal but no firewood to prepare food. Nor have the displaced persons been given any vegetable or cash dole. Of the 44,071 inmates, 17,971 or an overwhelming 40.78 per cent are listed as minors by the government. Yet, there is no baby food. Nor is there any special treatment for 200 women who are in advance stage of pregnancy. Sanitation and hygiene is a serious problem. In Karbi Anglong, 32,871 inmates have been provided only 8,504 plates. It means four persons have to share a plate. To paraphrase Chief Minister Tarun Gogoi, such things including the macabre killings are bound to happen in the jungles. Since the partition in 1947, India had its own share of communal riots displacing millions of peoples. Yet, India often dealt with such conflict induced displaced persons with ad hocism and apathy. There is no standard on providing basic humanitarian standards — adequate housing, food, health care, education and protection. It depends on the whims of government of the day. Consequently, the programmes for humanitarian assistance suffer from favouritism and discrimination. At present, India has over half a million conflict-induced Internally Displaced Persons respectively — 200,000 consisting of the Adivasis, Bodos, Muslims, Dimasas and Karbis in Assam; 2,62,000 Kashmiri Pandits from Jammu and Kashmir; 35,000 Brus/Reangs from Mizoram and about 50,000 displaced persons in Tripura. Among the displaced, the Kashmiri Pandits are the favourites of New Delhi. Not that their conditions are ideal but better than most others. They have been living in accommodation provided by the government. While a displaced Kashmiri Pandit from Jammu and Kashmir receives Rs 750 per person per month, an adult Bru receives only Rs. 2.67 paise a day i.e. Rs 80 per month. The standard of living of the Kashmiri Pandits is not so high in Jammu than in remote Kanchanpur sub-division in Tripura to warrant such blatant discrimination. The prices of essential commodities across India are the same and they are often more expensive in remote areas. The displaced Karbis and Dimasas have not been even provided Rs 80 per day as cash dole. On November 18, 2004, the Central Government agreed in principle to release Rs 150 crore to set up the two-room sets for about 56,380 Kashmiri migrant Pandits living in different camps in Jammu. In comparison, the Assam government has even failed to provide Rs 10 crore for 23,742 displaced families who were displaced after the Bodo-Adivasi ethnic violence during 1996-1998. After a meeting between the armed opposition group, the Adivasi Cobra Military of Assam and the Chief Secretary of Assam on June 9, 2004, the state government agreed to release Rs 10 crore based on the proposal submitted by Health Minister Dr Bhumidhar Barman as the Chairman of the Cabinet Sub-Committee on rehabilitation of IDPs. In October 2004, the government once again promised to release Rs 10 crore for their rehabilitation. The majority of the people have still not been rehabilitated. Even the conditions of the border migrants, who were forced to flee their homes along the India-Pakistan border in Jammu and Kashmir, have been deplorable. Though 45,000 of them have returned to their ancestral villages and have enjoyed peace on the Line of Actual Control in the Jammu sector following the enforcement of the ceasefire with Pakistan, over 12,000 people, including women and children, continue to spend days in penury and misery at camps at the Devipur in the Akhnoor sector. Those who returned to their villages were reportedly not provided cash assistance to repair the houses. Those living in the camps alleged that promises of allotting small plots and financial assistance for building houses in safer areas were never fulfilled. On March 2, 2004, the Chairman of Border Migrant Action Committee, Chajju Ram of Nikkian village in Khour Block of Akhnoor Tehsil in Jammu District succumbed to the injuries he received from the police on February 27, 2004 during a lathi-charge on the protestors demanding rehabilitation. The Government of India has been debating for the adoption of a National Rehabilitation Policy for the persons displaced by development projects. However, there are no such policies on the conflict-induced IDPs. This despite the fact that there is large number of displaced persons across the conflict-afflicted states. The Government of India must develop a policy for providing humanitarian assistance and access to essential food and potable water, basic shelter and housing, appropriate clothing and essential medical services and sanitation to the conflict induced internally displaced persons. There is a need to develop early warning mechanisms to prevent such conflicts. The proper rehabilitation of conflict induced displaced people must form the centre of peace building programmes in these areas. Otherwise, these displaced persons are most likely to become easy targets of recruitment by the insurgent groups. The human and material costs of addressing the insurgencies have always been exponentially high. Janata Dal (United) leader Sharad Yadav’s maiden election to the Fifth Lok Sabha in 1974 at the age of 25 coincided with the present Speaker Somnath Chatterjee also entering the portals of Parliament. It was none other than Socialist leader Jaya Prakash Narain who persuaded him to file his nomination for a byelection in Jabalpur. Yadav’s huge following in Jabalpur Engineering College and his election as President of the Jabalpur University Students’ Union marked the starting point of his chance career in politics. Born in Babai village in Hoshangabad district of Madhya Pradesh in 1947, Yadav was "always interested in politics" as his father, the late Nand Kishore Yadav was a Congress leader and his grandfather’s brother, Parikshit took part in the 1857 revolt. In the last 32 years in politics, he has cared little for power as evidenced by his resignation twice from the Lok Sabha — during the Emergency and in the mid-nineties on moral grounds for being charge-sheeted in the Jain Hawala case. He resigned from the Rajya Sabha over the Bofors issue. He has held key portfolios at the Centre including that of Civil Aviation, Labour and Textiles and played an important role in pressing for the implementation of the Mandal Commission Report. Yadav has been to jail several times under the Maintenance of Internal Security Act — for nine months in 1971-72 and for 11 months the following year and again from 1974 to 1977. In his spare time, he enjoys listening to classical music or singing folklores that take him back to his roots in Bundelkhand. Q: After forming the government in Bihar, is the JD(U) considering spreading its wings to other States where Assembly elections are due in 2006? A: Our party does not wield much influence in the states that are going to the polls. We will contest only where we have power. We have just gone through with the Bihar Assembly elections. I have visited Assam, West Bengal and Tamil Nadu. The Janata Dal (United) has evolved from the Socialist Party, the Lok Dal and the Janata Dal. We will contest the elections under the NDA. In West Bengal, we are holding talks with Mamata Banerjee and the Asom Gana Parishad in Assam. In Tamil Nadu, nobody is with us in the NDA. Q: A section of the media has expressed doubts and uncertainty over George Fernandes continuing as the party President after his recent indisposition. Are these apprehensions genuine? A: No. These apprehensions are unfounded. There is no such discussion in our party. I see no problem in his health. Q: Is your party embarrassed about its alliance with the Bharatiya Janata Party following the recent expulsion of seven MPs in the Cash-for-query scam and the alleged sexual escapades of Sanjay Joshi, BJP General Secretary and a senior office-bearer of the Sangh Parivar? A: The difference of opinion between the BJP and the JD(U) was that the BJP wanted the matter to be probed by the privileges committee. My party position was that it is not a legal matter. Parliament is the biggest panchayat of the country and both the Ethics Committee and the Privileges Committee are constituted by the House. They can only recommend action. The real action has to be taken by the House. The Constitution has been made by this House called the Constituent Assembly. The Supreme Court and the bureaucracy are all creations of Parliament. We said that no matter what it costs us, we should uphold the dignity of the House. The BJP was not opposed to idea of taking action against the erring MPs. By taking prompt action against 11 MPs, the House has demonstrated that it has not taken the issue lightly. The MPs’ expulsion has strengthened people’s faith in democracy. What are 11 MPs among 800? Their expulsion was like removal of a dirty bucket from a well. The other sting operation you have mentioned is an internal matter of the BJP. Q: You have been Lok Sabha MP seven times and Rajya Sabha MP twice. How has Parliament changed? A: Earlier, issues raised in Parliament were influenced by the problems concerning the masses. Now the electronic media is dictating the agenda in Parliament which is unfortunate. Q: It is being said that the MPs’ expulsion is against principles of natural justice. Do you agree? A: This is wrong. Parliament is a sovereign body. It makes all legislations. If its members err, the matter has to be resolved by the Hosue. The opinion of the House is supreme and binding. After God, Parliament is almighty in this country. Q: What contributed to the overwhelming success of the JD(U) in the Bihar Assembly elections? A: The factors that contributed to our victory are simple. People in Bihar had seen the 15-year-long rule of the Rashtriya Janata Dal headed by Lalu Prasad Yadav. Bihar has an enormous development backlog and the people there are keen on development. The state is backward in every sector — be it education, health, power or road infrastructure. Everybody voted for us, regardless of caste, region or religion. It would be a challenging task for Nitish Kumar to fulfil promises but I am confident that he and his colleagues will meet this challenge. Mention the word “Europe” these days and most people’s minds speedily couple it with such words as “row” or “rivalry”. All the more welcome, therefore, that in defiance of those stereotypical images of disharmony, the Europeans — and yes, that does mean us — launched our first test satellite of the Galileo navigation system. This is the first step in an ambitious and costly project that will change the lives of millions in the near future. The final benefits of Galileo are still far off. Years of work have yielded only one satellite, the British made Giove A, launched from a Russian space station in Kazakhstan, which will have only a two-year life. But by 2010, when the European Space Agency has 30 satellites orbiting the earth at 14,000 feet, things will look very different. What we in Europe will then jointly possess is our own civilian-controlled navigation system of unique and unprecedented precision which ordinary people, as well as governments and big companies, will be able to access directly through receivers. It is not just air traffic control and other transport management systems that will see revolutionary change. Individual lives will be touched. Consider this: the astonishing accuracy of Galileo, which will enable users to locate their position on the ground to within inches, may mean that, with the aid of hand-held devices that speak directions, blind people will navigate dense city streets with ease. Galileo will help sufferers from the early stages of Alzheimers or others whose conditions render them easily confused, to reach their destinations through interfaces featuring simple arrows. Other potential beneficiaries are more obvious: lost taxi drivers, hikers stuck in the mist and tourists unable to find the right restaurant. Rescue services will be able to tell ambulances which lane to use on busy highways. Five-mile tail tailbacks on the M6 or M25 could conceivably become as delightfully archaic as the thought of a “pea-souper” in London, as motorists artfully hang off motorways long before they reach the pile-up. We will have to pay for it, however. And therein lies the catch. The European governments and private businesses putting money into this public-private partnership expect a revenue-generating service at the end. So get ready for howls of anguish at the price tag. But there will be plenty of time to argue over the cost. The project has been dogged by US opposition, as our transatlantic ally showed no enthusiasm about the prospect of Europe ending its monopoly on space-based navigation. The system was seen as a rival to the US’ Global Positioning System, and Washington tried hard to persuade some European governments not to take part. The Pentagon even suggested Galileo might pose a security threat, claiming its signals would interfere with those intended for the US military. There have also been any number of delays and spats between the funding governments. Only weeks ago Germany threatened to pull the plug, demanding a bigger stake in the project for German firms. Few may be knowing that Prime Minister Manmohan Singh’s wife, Gursharan Kaur was a student of Indian music and a fan of the legendary Ghazal singer Farida Khanum. This disclosure was made by the Prime Minister himself at a recent function held in Gwalior to facilitate Khanum and vocalist Malini Rajurkar. Dr Singh and his wife flew to Gwalior to present the Ustad Haafiz Ali Khan Award to two music celebrities. The late Ustad Haafiz Ali, is the father of renowned Sarod maestro, Amjad Ali Khan and became a legend in his lifetime. Trained in classical music under the tutelage of luminaries like Ustad Bade Ghulam Ali Khan and Ustad Ashique Ali Khan of the Patiala Gharana, Farida Khanum migrated to Pakistan soon after Partition where she carved a niche for herself as one of the most brilliant living performers of the ghazal. She came to be known as the Queen of Ghazals. Born in Kolkata and brought up in Amritsar, Khanum crossed the borders soon after the division of the sub-continent. She rendered her first concert in Lahore in 1950 and made a mark. Such celebrities of that time as Zeenat Begum and Iqbal Begum applauded her and forecast that she would rise to great heights. She was married soon after and her music career suffered a setback. Her husband, a businessman, had little interest in music. He was unappreciative of her talents. She got bogged down in rigid Islamic norms practiced in contemporary Lahore’s social circle. Subsequently, Khanum had to stop singing in public. She devoted most of her time in looking after her husband and children. In spite of the busy domestic routine, she could manage to get some time to practice in the seclusion of closed doors. Music was, after all, a part and parcel of her life. At last her love and devotion for music won and gradually her husband started responding to the nuances of her beautiful voice. In mid sixties, Khanum’s husband allowed her to sing in government sponsored music concerts and conferences and, later, granted permission to perform in select public concerts. Tragedy struck Khanum in 1978. Her husband passed away leaving behind four daughters and a son. By that time, her name and fame had spread throughout Pakistan. In India too, she became a household name. Khanum took to signing as her avocation and regaled the audience with her exquisite rendering of ghazals and thumris. She not only has a very good voice range but also a voice packed with sentiments that touches the heart of listeners. Owing to her expertise in ghazals, she is treated as the uncrowned Queen of music in Pakistan. People also fondly address her as the Queen of Ghazals. Khanum has sung the choicest ghazals of many renowned poets like Faiz Ahmad Fasiz, Daagh, Agha Hasher Kashmiri and Sufi Tabassum. If the world of ghazal music was captured by one song by any artist, then it has to be Farida Khanum. Whoever has listened to her ghazal Aaj Jaane Ki Zid Na Karo — was totally enchanted by her artistry of presentation and the literary content of the composition. If the ghazal is considered to be the conversation between two lovers, then this musical piece could be considered as one of the best representation of such expression. Farida Khanum is, perhaps, the only singer in the subcontinent whose voice had always been able to keep the rhythm on leash. As a critic choose to tell her, Taal appki aavaaz ka peechha karta hai. She simply nodded her head. Farida Khanum belongs to an era when our cultures were the same, our thinking was the same. She is the epitome of that age, said Sarod maestro Amjad Ali. 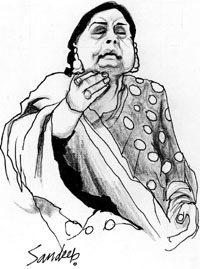 One hopes that artists from India and Pakistan will be able to create the same place in peoples’ heart as she has done. I accepted the invitation and went to speak. As I entered the University Hall it was packed to capacity, but full of boys. I enquired if this university was only for boys since there were very few girls present. I was told this was an indicator of the culture of the university. Girls still avoided events where boys were expected to turn up in large numbers. First: About the dose/experience with the boys’ invitation and then the girls’. The introductions began with a large number of student representatives / union members, present and past, coming on to the stage to present thick/ fat garlands. There were far too many of them for my height and weight. Obviously, it was a situation where the main organisers had to accommodate or oblige some. Those who came up on the stage waited till the photographer clicked. I was told that a few of those presenting me the flowers had been on the wrong side of the law. I obviously was in no position to sift or stop. I of course did not allow a re-circulation of the presented garlands which often happens in such events for photo opportunity. I kept the ones given to me to myself. But the fact that the past and present union leaders came to hear what I had to say, knowing what I was likely to say, was indicative of a positive pressure they had come under. Basically, it had become an increasing need for acceptability and respectability whatever the past be. I began by asking the boys present in the hall, if they as students and as youth of this great university, individually and collectively had a plan? I explained, just as the country has an economic plan, a political plan, an educational plan a defense plan including now a disaster management plan, what was their plan? And can a university or a college not have a collective plan, a collective dream, a collective vision? What was their mission statement, I asked. Can any of you stand up and tell me? The truth is, I stated, that since there was silence as I observed, most of the youth merely drift. And is this not a possible reason for some of the young men to become mere numbers to be used? To demonstrate, bully or attack? ‘Those of you who have a focus and a plan cannot be used or abused.’ I asserted. Criminalisation in universities happens when some students are on sale and when education is not their focus. Cheap recognition is their immediate motive. These ‘bought’ students know they will not make it in the examinations hence they choose mentors (sic) who may get them a degree without meriting it. They are lured by false assurances, expectations, pretences and money. That is why they are on sale. Any student who does not have a focused plan for his/her student career has his/her time on sale, in kind or cash. The criminal elements are in need of such ‘fools’. These owners /users come hunting and entice young gullible minds to fall into a trap. 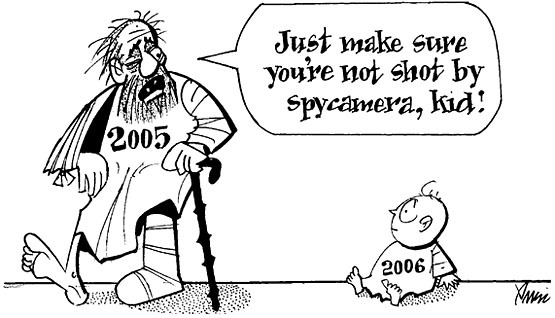 They get into the records of the police and intelligence agencies and thereafter have to ‘buy’ their certification of ‘good antecedents.’ Once they cannot get a clean verification, they find it safer to stay in the criminal sanctuary. This is how criminalisation gets rooted. Their presence fouls the academic atmosphere in the university. While serious students struggle with examinations, the criminalised elements have the examinations put off. Now on to the interaction with girls. My one look at their assembly gave away the question writ large on their faces. They all wanted to know how do they continue and study further when their parents are not encouraging them to. A very tough question to answer! And what do I tell them? The girls were here only for a degree, not for career. Only the very few had their parents’ blessings to move on and make their careers. For the rest they were there just for the sake of a degree to be married as soon as they return home. They were all birds getting ready to be flown out to a new nest. They pleaded to tell them what to do…. Alongside I had noticed that the girl who had introduced me was literally trembling as she had introduced me. I asked her if this was her first stage experience. She said, yes it was. I asked the girls what was the stage here in the hostel for? For others? Why not them? Why don’t they take turns daily and come up on the stage, to find within themselves their hidden unexpressed talents. This will be one of the strongest ways by which they will acquire confidence and stand up for themselves. And this is what they are lacking most. I turned to teachers and pleaded they assist girl students to do so. And how about the university holding some sessions with the girls’ parents from time to time? There are no short cuts to confidence building or life making, whoever it might be. For the last 17 years, cultural activists and artists come together on a common platform, performing for hours at a stretch. I have heard one of the best classical and semi-classical renderers at this platform. I feel it’s a nice way to usher in the new year. Traditional in every sense of the term, there are no entry tickets. You simply sit in a baithak and get carried away by the renderings. This year’s memorial is dedicated to the celebration of 75 years of the historic Dandi March by Gandhiji. The highlights will be Dhrupad singing by Ramakant and Umakant Gundecha, Astad Deboo’s dance, Sufi-Bhakti poetry renderings by Mita Pandit, Madangopal Singh, Vidya Shah. Special musical inputs by Jasbir Jassi, Sunanda Sharma, Mandakini Banerjee, Elango and urban folk singer Sushmit Bose. Dance by Navtaj Jauhar and street theatre by Act One. There will also be an exhibition of art works on Dandi March by artists Amit Ambalal, Jatin Das, Jehangir Sabavala, K.G. Subramanian, Nilima Sheikh, Haku Shah, Arpana Caur, Jogen Chowdhury, Atul Dodiya, Orijit Sen, Vivan Sundaram and Subha De. In keeping with the previous years, this concert will be held at the Vithalbhai Patel House complex, for hours, almost spilling into the next day. I don’t know how the so-called who’s who are planning their new year take-offs. For one, my definition of the who’s who doesn’t really tally with the in-vogue current one. Also stands out the fact that the rich and the political mighty have their fixed places to go and unleash their power and more. Nothing really exciting to report on that front. It’s the ordinary that has the potential to go beyond and show a way out. On January 12, Prime Minister Manmohan Singh will release Khushwant Singh’s latest book, The Illustrated History of the Sikhs (OUP). This volume is adapted from his earlier two volumes on The History of the Sikhs with two major highlights. The two volumes have been put together into one. And there are a series of illustrations (rare paintings, photographs, portraits, etchings, prints). There couldn’t have been a better gift for the new year by our grand man of literature, Khushwant Singh. I must offload this rather touching sight. On Friday evening, as I was driving back home and passing the IIT campus, I had decided to meet my friend Prof V.K. Triparthi, who teaches Physics at this institute and resides in the campus. What I saw was an amazing sight. On one of the sprawling lawns, this academic was sitting with about 15-20 research scholars. No, not holding a class in Physics but teaching these students about the value of human life and emotions and how to bridge that gap has come about between the majority and minority communities in the country. His students told me that he holds this meet every Friday evening and for over two hours they discuss current issues. On the ongoing issue of terrorism, Tripathi said there are three types of terrorism — terror by regular terror groups, terror by the imperialistic forces and terror struck by communal forces. Terror and terrorist activists should not be associated with any religion. This will be totally unjust and foment tension between communities. New Delhi’s Institute of Social Sciences has done tremendous work for the promotion of local governance. This weekend they launched a website, - Global Network on Local Governance (GNLG). This website would be a great source of connectivity as it provides database on various issues related to local governments in different countries. There is more news from ISS. There is an announcement for ‘Awards for Outstanding Women Panchayat Leaders 2006’. The awards will be presented at a function at ISS to mark Women’s Political Empowerment Day on April 23-25, 2006. For details, contact ISS, 8, Nelson Mandela Road, New Delhi-70. Email — issgen@ vsnl.net. What you have to do tomorrow, do today; what you have to do today, do now. What will you do if death were to strike you at this very moment? The portions of men and women differ because a family man is obliged to support others, while a woman is not. The heart of the devotee is the abode of God. He dwells, no doubt, in all things, but he especially manifests himself in the heart of the devotee. Whoever has come will have to go whether he is the king, a pauper or a fakir. But that doesn’t stop one from continuing sitting on a throne or keeping some one tied in chains. Some people neglect or give up their duty in life for the sake of a spiritual life while others excuse themselves from spiritual practices saying that they have not time. The Lord’s message is to sanctify the entire living process itself. If we keep fanning our anger and letting our hatred grow, our quarrels continue unceasingly. When people compromise themselves, they may seed excuses from their situation, without having explored their real alternatives. Bhakti, love is God, is the essence of all spiritual discipline. Through love one acquires renunciation and discrimination naturally. There is no act which is totally pure or totally impure. How we approach an act determines whether it is more pure and impure. Who, then is a devotee? He whose mind dwells on God. But this is not possible as long as one has egotism and vanity. All snares of attachment, worldly love and pleasure blacken our body and soul.